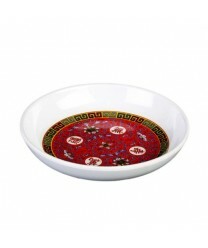 Beautiful colors, traditional Asian styling, and durable construction combine in the Thunder Group 1003TR Longevity Sauce Dish 3-7/8". Strong yet lightweight and easy to handle, this pretty round sauce dish is ideal for use in restaurants, sushi bars and other high-volume eateries. This 3-ounce sauce dish is NSF-certified, and it is dishwasher safe, so cleanup will be easy and convenient.